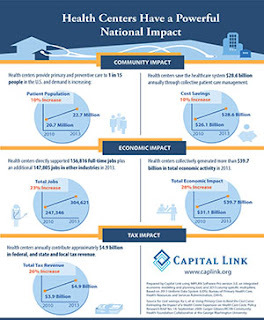 Using an integrated economic modeling and planning tool and the latest Uniform Data System information (2013), Capital Link calculated the economic effects of health centers across the nation. Health centers collectively generated more than $39.7 billion in total economic activity for their local communities in 2013 – a 28% increase since 2010. Health centers directly supported over 156,000 full-time jobs plus an additional 147,000 jobs in other industries, a 23% increase from 2010. Download a copy of the infographic here. In the past, health centers have used this information to educate policymakers, seek community support, and pursue funding opportunities. 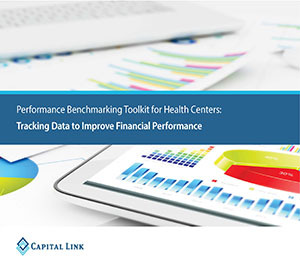 For more information on the variety of community impact analyses Capital Link offers for health centers and PCAs, visit our website or contact Steve Rubman, Capital Link's Director of Information Systems, at srubman@caplink.org. The health care industry is experiencing rapid change brought on by demographic shifts, economic influences, policy changes, and mandated system adjustments. These changes are especially significant for Federally Qualified Health Centers (FQHCs) because of their significant reliance on government programs for reimbursement. 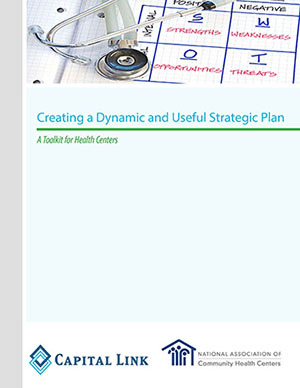 While always important, strategic planning has recently become an organizational imperative for health centers as they seek to successfully navigate uncharted territory. Creating a Dynamic and Useful Strategic Plan, an interactive resource developed by Capital Link and the National Association of Community Health Centers (NACHC), provides health centers with a toolkit to create and maintain a useful strategic plan. Organized into five sections, it begins with tools for health centers to examine and reaffirm their mission and purpose and then provides a pathway to generate well-informed expectations, measurable organizational objectives, and definitive steps to attain goals. Finally, it offers tools to distill this information into the critical actions health centers need to manage strategically and achieve sustainability. This toolkit was supported by the Health Resources and Services Administration (HRSA). Access this resource at www.caplink.org/resources/publications and MyNACHC. Health Centers with Capital Project Plans Should Act Now! The U.S. Department of the Treasury’s Community Development Financial Institutions Fund announced the awardees for the 2014 round of New Markets Tax Credit (NMTC) allocations. The awards, which total over $3.5 billion, are aimed at revitalizing low-income communities and increasing economic opportunity nationwide. The 76 Community Development Entities (CDEs) that received these awards are actively seeking projects to finance. This is great news for health centers, given that many CDEs are interested in providing financing for community health center expansion and renovation projects. Capital Link is proud to announce that our lending affiliate, Community Health Center Capital Fund (Capital Fund), has been awarded a $25 million NMTC allocation. This opportunity will help us provide health centers with greater access to this funding option and allow us to streamline and accelerate the process for eligible projects. While NMTC financing is a critical source of low-cost capital and equity for health center facility projects—often securing approximately 20-22% of total project costs—obtaining credits from a CDE with an allocation is a highly-competitive and complex process. Interested health centers must demonstrate a high level of project readiness and be able to communicate the merits of their projects to CDEs with allocation. Furthermore, the process of structuring and closing an NMTC transaction is complicated and the terms, benefits, and fees offered to borrowers vary widely. For help in determining whether NMTC financing could be a good fit for your health center, please contact Mark Lurtz, Senior Director of Marketing and Project Consulting at mlurtz@caplink.org or 636-244-3082 or Mary Ann Wayne, Director of Loan Programs, Community Health Center Capital Fund at mwayne@caplink.org or 617-988-2230. To learn more about the NMTC program and how it works, click here to access our Spotlight on Capital Resources: New Markets Tax Credits publication and our recently released Spotlight on Capital Resources: New Markets Tax Credit Program Update. Capital Link has been awarded a $75,000 grant through the USDA Rural Development's Rural Community Development Initiative (RCDI) program. Funds will be used to provide technical assistance and training in collaboration with regional Primary Care Associations/consortia to support 15 rural health centers in high-need states. Capital Link is one of 31 community-based organizations across the US selected for the RCDI grants, which will help small rural communities create jobs and boost economic development. Access the press release here. The New Markets Tax Credit (NMTC) Program can be a powerful financing tool for health center capital projects. Capital Link’s latest resource publication, Spotlight on Capital Resources: New Markets Tax Credit Program Update, focuses on this valuable option and is now available to health centers and PCAs on our website. To date, Capital Link has assisted 43 health centers in obtaining over $552 million in financing for projects totaling over $669 million using NMTCs. To find out how Capital Link can help your health center capitalize on this financing option, please contact Mark Lurtz at mlurtz@caplink.org. The Massachusetts League of Community Health Centers today released an economic impact analysis which shows that the Commonwealth’s 49 health centers generate annual savings of more than $1 billon for Massachusetts. The analysis, conducted by Capital Link -- a national non-profit organization that works with health centers to plan capital projects, finance growth and identify ways to improve performance -- primarily relied on the federal government’s Uniform Data System (UDS), a core set of data used to review the operation and performance of health centers, including information on their costs, revenues and patient utilization rates. Today the Health Resources and Services Administration (HRSA) released a funding opportunity announcement for the fiscal year (FY) 2015 Health Infrastructure Investment Program (HIIP), as authorized by the Affordable Care Act. HRSA anticipates awarding up to $150 million to support an estimated 150-175 projects. Applications are due by April 21, 2015 via Grants.gov. Supplemental information is due in EHB by May 21, 2015. Access the funding announcement at http://www.hrsa.gov/grants/apply/assistance/hiip/. 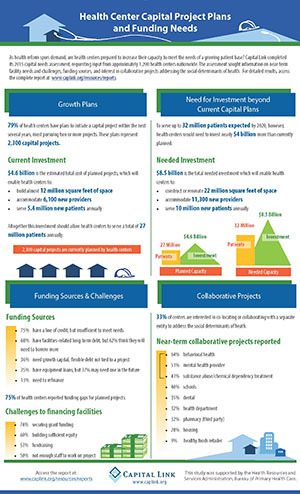 The HIIP funding opportunity supports existing Health Center Program grantees’ efforts to increase their patient capacity and to provide additional comprehensive primary and preventive health services to medically underserved populations through the alteration/renovation, expansion, or construction of a facility. Applicants may apply for a ceiling amount of up to $1,000,000. HRSA is hosting a question and answer application assistance call on March 24, 2015 from 2-3 p.m. ET. The Dial-In Number: 1-888-456-0354; Passcode 4004363. Capital Link provides a variety of services that can assist health centers with aspects of this application, including service area mapping, financial forecasting, patient-centric operations planning, and financing assistance for larger projects–including project-specific structuring of financing, forecasting, business planning and lender negotiations. Contact Mark Lurtz, Senior Director of Marketing and Project Consulting at mlurtz@caplink.org or 636-244-3082 for more information.